We specialise in long term rent Paphos, also long term apartment rental, long term property rental, long term villa rental, in the paphos area of Cyprus. Our database contains villa and apartment property for long term rent in many of the Paphos villages. If you are looking for a long term villa, apartment, townhouse, bungalow, semi detached house or any type of property you will be able to search for it in our database. We also have other long term rentals that are not shown on the website. We can also find many other properties in other locations please just send us your contact details and your requirements. Paphosdirect is a family run business, based in Paphos, we specialise in advertising long term rental property market in the Paphos area. We have been operating since 2002 assisting our clients who are looking for long term property for rent in Paphos. We have experienced staff from the UK and Cyprus with many years of knowledge of Cyprus and the Paphos area that are able to offer you genuine advice and guidance with regard to the Paphos regions and properties. We moved to Paphos from the UK many years ago and went through the difficult process of finding a long term rental. Back then the long term rental market was very small and finding a suitable long term villa was very difficult. As a result of this experience we founded paphosdirect to make the whole process of finding a long term rental to living there happily for many years so much simpler. We aim to uncomplicate the process of renting and give our clients a personal service by asking you the questions necessary to pinpoint your exact requirements and matching them to what properties we advertise. We are not like a rental agent Paphosdirect has also assisted our clients with advice on moving to Cyprus, purchasing of motor vehicles, where to purchase electrical goods and furniture. We can recommend solicitors and accountants for clients wishing to set up their own business. We have assisted clients needing to have broadband installed or sky/UK TV services. PaphosDirect does not store or retain clients personal data. We can offer for rent villa Gemma which is a lovely 3 bedroom villa with private pool, enjoying sea views in a lovely location in the Tala area of Paphos. The villa is available to rent fully furnished with modern furniture. The modern kitchen is fitted with quality units and equipped all appliances: washing machine, dishwasher, fridge/freezer, hob, built-in oven, microwave, toaster, kettle. Villa Gemma has a large lounge with 3 seat sofa, a 2 seat sofa, 1 armchair, coffee table, TV,. The property has a dining table and chairs for 6. A WC completes the downstairs layout. The property has 3 bedrooms with the master bedroom having an en-suite shower. The other 2 bedrooms have a lovely family bathroom. Externally the property has a lovely 8m x 4m pool with front and rear gardens. Palm Grove villa is a beautifully presented part furnished 4 bedroom detached property situated in lower Peyia, built on the edge of a ravine featuring large established gardens, a wonderful large furnished balcony and private swimming pool with both sea and mountain views. The open plan lounge features matching Italian wicker suite with the second lounge area and LCD TV. Patio doors from the lounge lead onto a magnificent furnished veranda  again featuring two separate seating areas. The large modern cherry wood kitchen is beautifully presented featuring all stainless steel appliances comprising  hob/oven, fridge/freezer, dishwasher, microwave and all kitchen utensils. Leading from the kitchen is a lovely dining area furnished with an Italian wicker glass dining table with five matching chairs  again as does most of the villa patio doors lead onto the veranda with spectacular sea views. Situated in a quiet location close to Peyia Village is this delightful fully furnished 4 bedroom detached villa with swimming pool and gated driveway. Villa Elena is a 3 bedroom villa with private pool, enjoying a lovely countryside location in the Arodes area of Paphos. The villa is available to rent either fully furnished or unfurnished. The kitchen is fitted with nice units and equipped with appliances: washing machine, fridge/freezer, hob, built-in oven, microwave, toaster, kettle. Villa Elena has an open plan lounge with sofa's, coffee table, TV. The property has 3 bedrooms and a lovely family bathroom. Externally the property has a lovely 8m x 4m pool with front and rear gardens. With outdoor bar area and BBQ. Villa Niko is a lovely 3 bedroom villa with lovely sea views located in Peyia village. Villa Niko has an open plan dinning and sitting area and an open plan kitchen equipped with hob and oven. The villa is has 3 bedrooms and a family bathroom on the first floor. The villa is fully air conditioned. The property also has a solar heater for hot water, double glazed doors/windows, Provision of telephone and internet. Outside there is a a swimming pool and a patio area, also covered parking. This superb stone-built bungalow is perched on a hillside overlooking Koili village and has the most spectacular views. 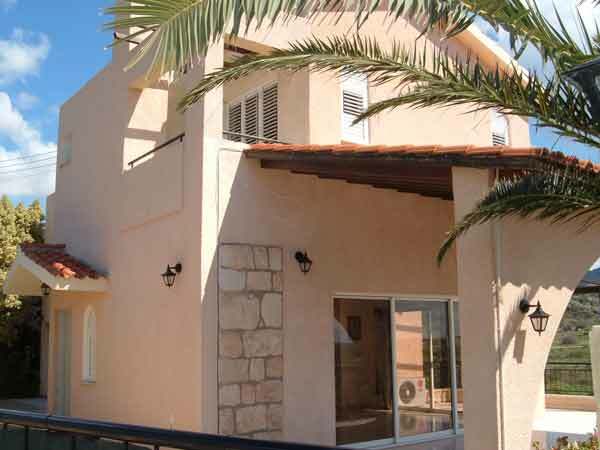 Koili stone villa is fitted throughout with quality fixtures and fittings. - kitchen equipped with all appliances - hob/oven, washing machine, fridge/freezer etc. - furnished lounge with TV, DVD, dining for 6 perosns. This villa is highly recommended. We can offer for rent a beautiful large villa of 400 square meter in Elioudia village 3 km from airport Paphos and 3 minutes from the sea. The villa has mountain views and second floor sea view. The villa is close to Timi village. The villa has 3 large bedrooms, the large master bedroom has an en-suite with toilet, washbasin, and shower. The property has a good sized lounge with working fireplace. The large kitchen has large American fridge freezer, fitted hob and oven. The villa also a second large lounge with gym accessories and a bar and toilet. The kitchen has a utility room with a washing machine. There is a garage for 2 cars with electric door. Externally the villa has 2 pergolas and very big verandas around 160 square metres with palm trees. 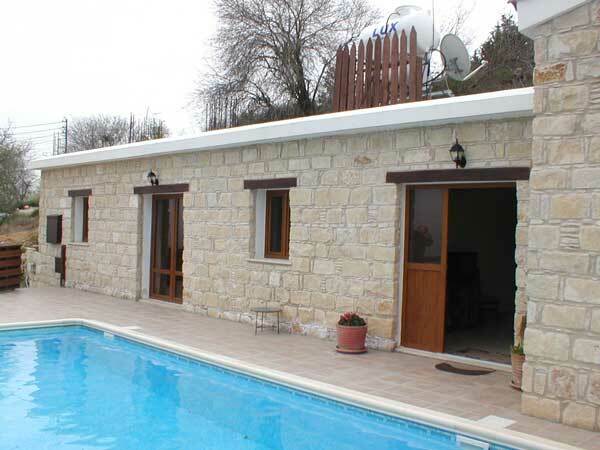 We can offer for rent this beautiful large luxury villa in Peristerona village near Polis. 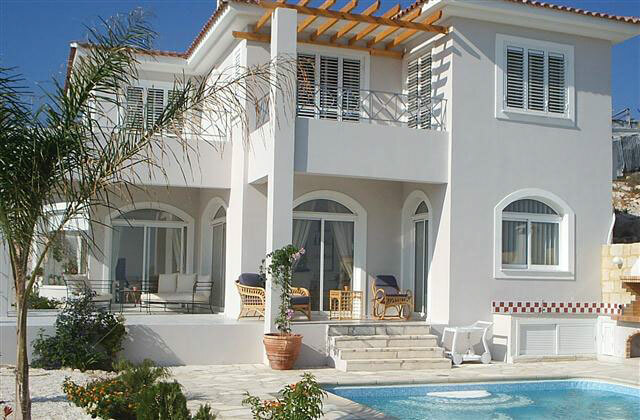 Villa Alex is a 5 bedroom 3 bathroom property with wonderful unobstructed sea and mountain views. The villa is located in a private postion yet still offers easy access to the village. The villa has a fully equipped main kitchen and a kitchenette with an extra oven and hob. The villa has contemporary furnishings which match the traditional Cypriot style building. Externally the villa comes in to it's own with lovely gardens, covered pergola , umbrellas and trees that seclude the villa and its pools. 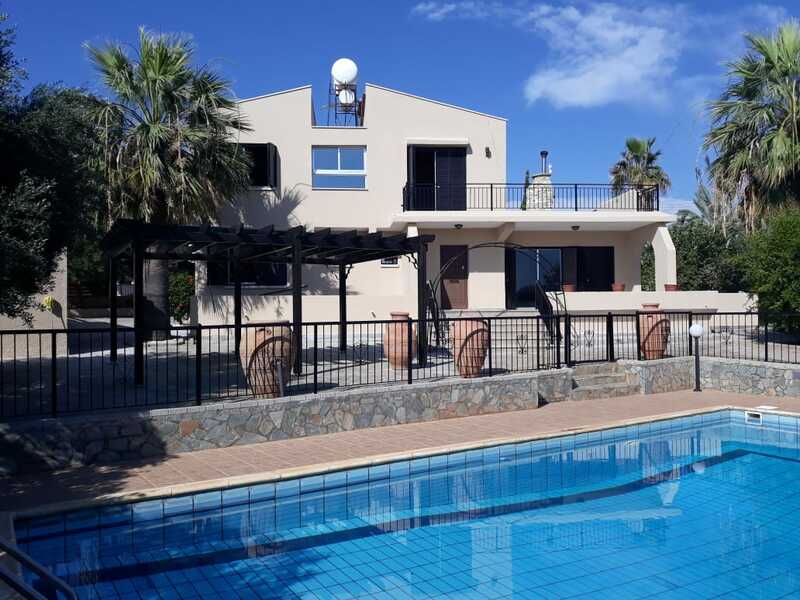 We can offer for rent villa Harvey which is a lovely 3 bedroom villa with private pool, enjoying sea & mountain views in a lovely location in the Coral Bay area of Paphos. The villa is available to rent part furnished. The modern kitchen is fitted with quality units and equipped with hob/oven with doorway leading to a large lounge diner. The property has 3 bathrooms with the master bedroom having an en-suite. Externally the property has a lovely 8m x 4m pool with gardens back and front with off road parking. The villa is fully air-conditioned and in immaculate condition, 5 min walk to all amenities. The rental price includes the maintenance of the pool and garden. This unfurnished villa is located in the sought-after Melissovounos area of Tala. The spacious lounge features an open-hearth fireplace and large, full height patio doors to take in the fabulous views. Marble steps lead up to the separate kitchen with built-in oven and hob and the dining area. There is a guest w.c. on this level and a very large under stair storage area. On the first floor are the 3 double bedrooms, all with fitted wardrobes and patio doors. The master has an en-suite bathroom and there is a further family bathroom. All bathrooms are fitted with marble vanity unit surfaces. Patio doors from the master bedroom lead onto the very large upper veranda which runs the length of the villa. This lovely 2 bedroom spacious luxury apartment with great location is sandwiched in between Paphos Old Town and the harbour, the apartment is secluded and quiet. It is just a 5 min drive to the beautiful sandy beaches, the famous Bar Street, restaurants and other amenities. Wonderful interior design, big terrace off the lounge and bedroom, and min walk. AC and fans in all rooms. Sinogi Suite is more suited to adults who don't require a pool and want to be in a beautifully furnished apartment that is very reasonably priced and is just a 15 minute walk to the main Kato Paphos centre and 20 minutes walk to the beach. The surrounding area is requiring a face lift but the apartment has just had a fabulous makeover with all brand new high end furniture and is in a great location close to all facilities. Villa Petros is a beautiful executive 4 bedroom villa situated in Seacaves and in a very private location. The villa is brand new and the garden and pool area are yet to be completed. The property features a large open plan living/dining area with a suite and dining kitchen with seating for 6 people, the villa has quality furniture throughout. The very impressive modern kitchen has been beautifully designed featuring all quality appliances including fridge/freezer, oven/hob etc. The kitchen is supplemented by a good sized utlility room. The villa has 4 good sized bedrooms, The bedroom on the ground floor has an en-suite shower. The master bedroom on the first floor has an en-suite bath and the further two bedrooms on this floor both have en-suite showers. 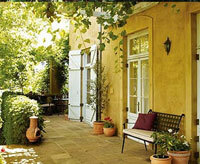 The outside is also very large and will have lovely gardens. A private swimming pool can be provided also. Villa Petros benefits from central heating and air-conditioning. Apartment kronis is a lovely 3 bedroom air-conditioned apartment in lovely grounds with communal pool. This spacious terraced house is located in a very desirable and exclusive part of Paphos and situated in the gated residential complex of the highest quality construction and finishes. Complex facilities include 2 large residents’ pools with secluded relaxation areas, fabulous and well kept gardens, walkways and fountains. The property comprises an open plan spacious dining and living area, and a comfortable modern kitchen separated by a breakfast bar. The lounge patio doors give access to a large veranda offering fabulous views of the surrounding green park. On the same level there are 2 double bedroom with wardrobes, a family bathroom and an en suite shower room. A wooden staircase leads to upper floor bedroom and bathroom and to a study room with access to a huge private veranda offering partial sea views. a shower and bath. Villa Dio is a lovely 4 bedroom Bungalow with amazing unobstructed view of Polis Chrysochous bay, Akamas and the Troodos mountains. The property is 160sqm on one level, built on a plot of 750sqm which is all fenced, with a landscape garden and a spacious large veranda. Villa Dio has a spacious dinning and sitting area with a fireplace and an open plan kitchen equipped with hob and oven. There is also a guest WC. The villa is has four en-suite bedrooms, 2 bedrooms have en-suite showers and the other 2 bedrooms have en-suite bathrooms. Outside there is a covered BBQ area equipped. A large swimming pool and a pergola. This is a four bedroom villa overlooking Coral Bay and situated on the outskirts of Peyia Village. The villa has a private swimming pool with spectacular sea views. The property is available to rent unfurnished. The kitchen is equipped with hob and oven. The villa features two bedrooms on the ground floor and two further bedrooms on the first floor both having en-suite bathroom. The property has 4 bedrooms in a 900 square meters plot. The villa has 4 bedrooms. Air condition in the bedrooms. Covered parking place for two cars. We can offer for rent Koloni View which is a lovely 3 bedroom villa with private infinity pool, enjoying country views in a lovely location in the Koloni area of Paphos. The villa is available to rent unfurnished. The villa has a modern kitchen with hob/oven. The master bedroom has an en-suite bath. The 2 further bedrooms share a lovely family bathroom. Externally the villa a private infinity pool. The villa is located in a private location. The property has access to a large communal swimming pool and is set in the privacy of landscaped gardens and surrounded by terraces. Villa Pearl has a dinning and sitting area with an open plan kitchen equipped with hob/oven and kitchen appliances. The villa is has 2 bedrooms, the master bedroom has an en-suite shower. The property also has a family bathroom. Outside there is a covered seating area equipped. This impressive 3 bedroom centrally heated detached villa with swimming pool is set in very private and beautifully landscaped gardens close to Coral Bay. We are delighted to offer this 5 bedroom executive villa with exceptionally large gardens and situated in the sought after village of Tala. Villa Andreas can be rented either furnished or unfurnished and has a large lounge and dining area with fireplace. The kitchen is fully equipped with all modern units and stainless steel appliances. One bedroom is situated on the ground floor with en-suite shower room and a further 4 bedrooms on the first floor with the master bedroom featuring a jacuzzi. Also in the family bathroom is a bath and shower. The property also benefits from having a separate building in the grounds which could be used as a maids room or office and benefits from having a sauna room. The villa is fully air conditioned and has ceiling fans. 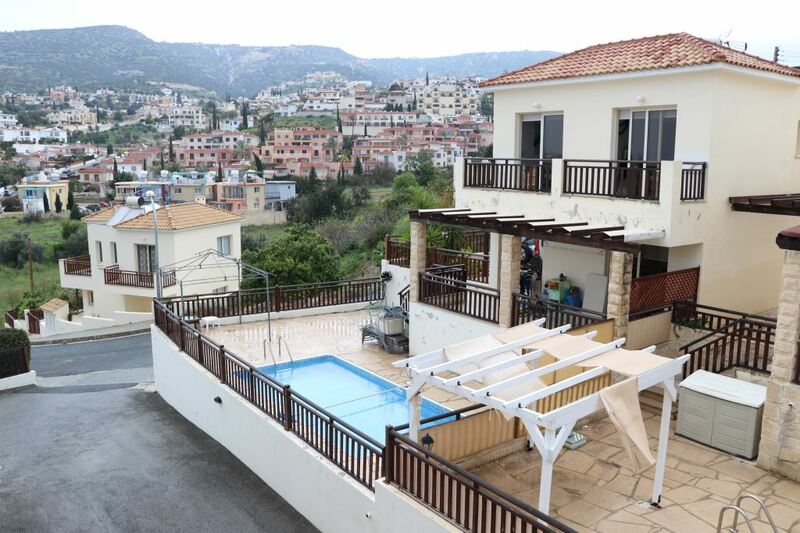 This modern quality 4 bedroom villa is available to rent unfurnished, and is situated on a small development of 4 villas in lower Emba with views towards the coast. The large open plan lounge has patio doors that lead onto a patio area and garden/pool area. The modern kitchen will be equipped with cooker, hob & hood. The property features one bedroom on the ground floor with en-suite shower and three further bedrooms on the first floor and family bathroom. Villa Yiannis is a new luxury 3 bedroomed villa thats available to rent on a long term basis for 12 months from November 2018. The villas ground floor has a fully fitted modern kitchen with fridge/freezer, an electric cooker with matching hob and electric fan, a microwave, washing machine, toaster, kettle, juicer and smoothie maker. The kitchen also has a black marbled breakfast bar with 3 black leather stools, following through to the dining area. Also downstairs is a cloakroom with WC. In the dining area is a smart and modern black dining table with 8 black leather chairs. The living room is fully fitted with 2 cream leather sofas a cream leather arm chair, standard lamps, rugs and pictures. To compliment this, there is also a surround sound TV system complete with Satellite. Available from November 2018. Villa Choli is a lovely band new 3 bedroom bungalow located in the village of Choli which is located in the countryside between Kathikas and Polis. The villa has lovely views overlooking the countryside and available to rent furnished. The villa features a large open plan design with a fireplace. The kitchen is equipped with hob and electric oven,. The property has three bedrooms and a family bathroom. The property also has a large yard with covered parking and BBQ. Villa Julianna is a large modern 3 bedroom villa located in Peyia village with good access to all amenities. This quality 4 bedroom villa is available to rent unfurnished, and is situated on a small development overlooking open countryside with views towards the coast. The exceptionally large open plan lounge features fire-place with large patio doors that lead onto a patio area and private swimming pool and garden. The modern kitchen will be equipped with cooker, hob & hood, with a large storage cupboard. Emba Villa features one bedroom on the ground floor with en-suite shower and three further bedrooms on the first floor and family bathroom. All bedrooms have built-in wardrobes. It is less than a 10 minute drive into Paphos Town and less than a 5 minute drive to the nearest large supermarket. This villa is one of nine on a small development . 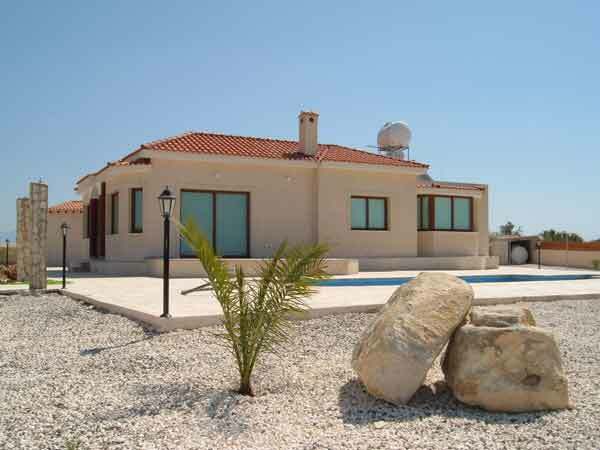 Villa Dmitry is a lovely 2 bedroom villa in Chloraka. Villa Orxidea is a lovely 4 bedroom villa located in Argaka near Polis. 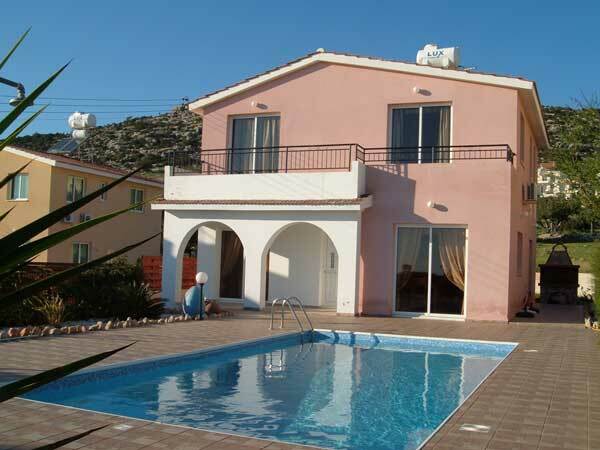 The villa is situated close to the sea and available to rent fully furnished. The ground floor features a large open plan design with modern furnishings consisting of two black leather settees along with two matching armchairs and a modern coffee table. There is a separate dining area with a table and seating for six persons. The kitchen is fully equipped with modern appliances including built-in dishwasher, ceramic hob and electric oven, washing machine and fridge/freezer. One bedroom is on this level with en-suite facilities. Archway to fitted kitchen, fridge freezer, gas hob,electric oven. Dishwasher. Microwave. Door to paved patio area. Downstairs cloakroom leading to utility room and washing machine. Villa Michaelis is a magnificent 4 bedroom villa situated in Sea Caves with private swimming pool and has large private landscaped gardens. This property is only a 5 minute drive to the popular resort of Coral Bay. Villa Michaelis has a large lounge/dining area consisting of 3 soafs, TV with hotbird SAT and a dvd player. The large kitchen is fully equipped with dishwasher, hob/oven, fridge/freezer, microwave, toaster etc. The double bedroom is on the ground floor and features a large en-suite shower room. There are two further single bedrooms and a double bedroom on the first floor each having en-suite facilities. The villa is fitted throughout with air-conditioning. 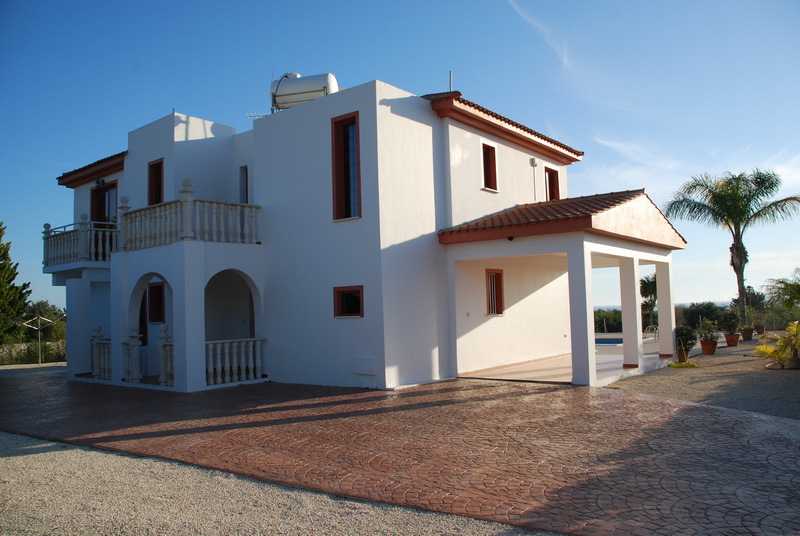 Villa Bella is a lovely three bedroom property situated in the sought after area of Seacaves and is in a peaceful location and close to the sea. You will find many restaurants and tavernas in the Seacaves area and only a short drive to Coral Bay where you will find numerous restaurants, tavernas, bars and of course the renowned blue flag beach. The villa has a large lounge/dining area and a fully equipped kitchen with hob/oven, dishwasher, washing machine and fridge/freezer. Villa Bella features one bedroom with en-suite on the ground floor and two further bedrooms on the first floor along with a family bathroom. 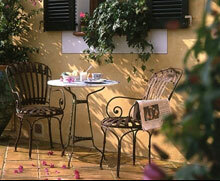 The outside features mature gardens and a private swimming pool with shaded areas for dining. This property has full air-conditioning and can be rented furnished or unfurnished. Hillcreast Villa is an executive 4 bedroom villa loacted in the village of Peyia. Set in landscaped gardens is this larger than average 3 bedroom detached villa with swimming pool and outside pool bar, located in the lovely area of Pissouri. The villa has 3 good sized bedrooms. The master bedroom has an en-suite shower, the other 2 bedrooms share a family bathroom. All bedroom are on the first floor. 8 x 4 swimming pool. Price includes pool cleaning and garden maintenance. For basic information on Paphos please use the following link 'Information on Paphos', we also provide a detailed description of the paphos areas using the links above. 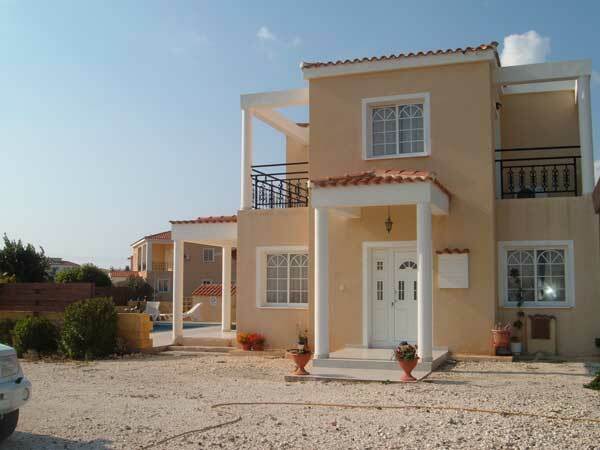 To view all of our long term rentals in Paphos click this link 'Long term Rent Paphos'. We do provide information on the 'Weather in Paphos' which is generally hot and sunny. Please use this 'Map of Paphos' to view the area we have described above. We also aim to provide a certain amount of 'News' from Cyprus and also a page about 'PaphosDirect'. We also have a number of holiday villas available please search via this link 'Rental Search' or via our 'Previous holiday Page'. If you would like to speak to us please ring 00357 99419734 or 99412546. We have quick links to long term rentals in certain Paphos areas via these links :- long term rent in Peyia, long term rent in Tala, long term rent in Chlorakas, long term rent in Sea Caves.